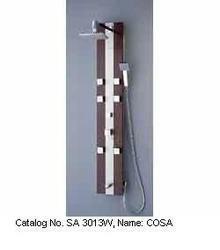 Cosa Product Code : SA 3013 W Available sizes : 1480 x 200 x 75 MM Description : High quality 304 grade stainless steel body in (matt finish) with solid wood in front with rosewood finish on it, stainless steel Rainshower, long brass arm, six brass self cleaning body jets, single lever mixer, brass Hand shower with 1.5mtr long hose and hook, it includes brass bath spout, all functions work individual or simultaneously, easy to install. Salus is a company with an experience of so many years. We are a company of a fifty year old group with a strong directorial team whose aim is not only to provide you the best bathroom fitting products but also render the best service with its most effective and intellect team of expertise. The products outsourced are matchless and exemplary. Salus is here to make your bathroom “designer bathrooms” worth living. With a team of expertise we give life to your bathroom. Salus being the global market leader is the trend setter and re-inventor. We have a vast range of products from bathroom accessories to bath products,bathroom fittings, furniture to sanitary ceramics all under one room for your dream bathroom. In the recent years Salus has developed strong associates all over India who have an architectural and technical team of expertise. The high quality products at Salus offers guaranteed products with maximum durability and with unique innovations of the bathroom fittings you can feel and savor the difference. Our unconditional commitment with transparency makes us an outstanding leader in the world of designer bathrooms. With no compromise in the quality of products we exceed the expectations and requirements of our clients.